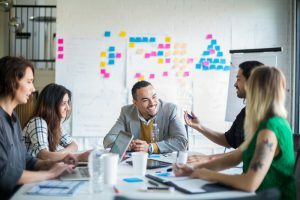 The top coaches are often asked by clients to facilitate executive team meetings and retreats about key decisions, strategic issues, and challenges. In fact, sometimes that is the first place the client wants to start, even before the coaching begins. Why miss out on great opportunities? Our facilitation training will get you prepared for any facilitation needs a client has. Facilitation is a natural extension of what you already do as an executive, leadership and/or business coach. By having a turnkey set of executive-level facilitation solutions – and knowing the best practices of being a top facilitator – you set yourself apart from other professionals and provide the best possible value to and impact for your clients. The Center for Executive Coaching is pleased to offer you our Executive-Level Facilitation Solutions Toolkit & Certification Program. You can purchase it here as a standalone program, and it is also included with our executive coach training and certification programs. Even if you already do facilitation work for clients, you should sign up for this facilitation training program to expand your solutions and take your capabilities to that next level…. The bottom line is that you will have a more successful practice and get even more satisfaction from your work. Open more doors. Many clients want to start with an executive retreat to discuss strategy, a change initiative, creating a stronger culture, or developing a more effective team. That leads naturally into coaching. By having facilitation tools, you open more doors to your coaching practice. Have more ways to attract clients. The more solutions you offer, the more ways you have to attract new clients. Keep clients longer with more ways to serve. Just as facilitation can lead to coaching, coaching can lead to facilitation. By being an executive-level master facilitator, you have more ways to serve your clients and keep them for the long term. Reach and work with top decision makers. Top decision makers value professionals who can help them with their most pressing problems. This program gives you solutions that let you do exactly that. Focus on strategic-level issues and the most pressing challenges that executives face. Click here for a list and descriptions of the topics covered. Have even more impact. The topics covered in this topic allow you to bring enormous value to your clients. What is more valuable than helping clients get clarity about strategy? Develop a strong culture? Plan for succession? Build a strong team? Engage employees? Create a business plan? Strengthen the board of directors? Facilitation is lucrative. The executive-level programs we offer here are the kinds of programs that allow you to charge top dollar. Second, many of them command fees well into the five figures, without taking a lot of your time. Why would you want to leave these sorts of opportunities on the table? Set yourself and your practice apart with the Master Facilitator Certification. Coaching and consulting are competitive fields. Being a Master Facilitator is another great way to set yourself apart from the crowd. Feel confident working with executives and providing the most strategic-level solutions. We work with you until you are confident with the content and how to use if for maximum effect with your clients. This program will also deepen your capabilities as a coach. The content in this program will also enhance your abilities to ask your clients powerful coaching questions and engage them in great coaching conversations. Work becomes more fulfilling. This program can add variety to your practice and enhance what you do. That way, work becomes even more fulfilling and you feel even more passionate about what you do as a coach and a professional. It is robust with proprietary content you can’t get anywhere else. Other facilitation training programs focus on basic skills and generic content like brainstorming and how to set ground rules for a group. Our program is for seasoned professionals, with a comprehensive package of proprietary solutions targeted to the most challenging and strategic issues that they face. You can’t find this content anywhere else. The focus is on results. The program is focused on equipping you to get results for clients. You will help them get clarity about difficult decisions, commit to action, and make plans to track progress and communicate results. It has been road tested and proven for over two decades. Every single solution in this program has been used successfully in the field since 1996 – in different countries, industries, and small and large organizations alike. And we continue to refine and update the content so that it remains current and relevant. The program gives you everything you need to succeed. Of course, facilitation is an art and a science, and requires you to be a great listener and agile on your feet with demanding clients. If you have that talent, you receive everything you need to deliver executive-level facilitation solutions to demanding clients – including just-in-time personalized support. You get all the personalized guidance you need. No other program offers the level of support that we do. We help you scope out engagements, prepare for upcoming facilitated meetings and retreats, and discuss results and next steps as engagements progress. The support is ongoing, directly from Founder and Director Andrew Neitlich. Your support doesn’t have an expiration date, although for legal reasons we have to give it a time limit of five years. Members of our program stay in touch with us for years and we are delighted to hear from them. Learn on your schedule. We know how busy you are and have designed this – along with all of our programs – so that you can learn the way you learn best. You can attend our live webinars, study the materials at your own pace online, or a combination. It is up to you. The program is designed specifically with high-end coaches and leadership advisors in mind. Other facilitation programs are designed for an audience with less education, training, and experience. Unlike other facilitation training programs, this is not a lightweight program with lots of basic content you already know. This is an executive-level training program. We do not waste your time with the basics, fluff, or theory that you can’t apply in a practical way. It is very affordable vs university programs – and without all the hoops that university programs make you jump through. We have researched the market and our program costs 1/3 what university programs charge, yet we believe that we deliver much more. That’s because we target this program for an executive-level audience. The program covers how to facilitate 17 executive-level topics, including: strategic planning, succession planning, creating a high-performance culture, leading change, succession planning, board development, and engaging employees. Click here for a full description of the topics included. Any single topic can lead to a single engagement that more than pays for the investment in this program. 17 live training webinars with instructions about facilitating a different executive-level challenge. Every other week we cover a different topic in the program, to give you time to absorb each topic and add it to your practice. The webinar lasts approximately two hours and is interactive so that you can ask questions. Don’t worry about missing a live webinar — they are recorded and placed in your member area for anytime viewing, and we are here to answer questions anytime. Presentation documents for each program that are ready to use with clients, one for each subject in our curriculum. You can use these slide decks as is or use them as inspiration to create your own client documents. Special training webinar: Keys to being a great facilitator. This is not a basic training about how to facilitate. Rather, it shares over two decades of in-the-field learning from facilitating hundreds of executive team meetings about what it really takes to get results as a world class facilitator. An exclusive member area with recordings of all training videos and all presentation documents. You receive a password to access a member area where you have ongoing access to the resources in this program. We also provide a Dropbox link so you can download the presentations. Sample scoping and pricing guidance. On each webinar, we discuss how to price each program according to different ways to structure it. Marketing guidance for each topic. Each webinar also discusses ideas to market different topics. Certification including “8.5 X 11” Certificate and digital logo attesting to your certification. Once you complete the curriculum, you receive Certification as a Master Facilitator. View a sneak peak of the strategic planning facilitation module in the program…. It’s simple. Simply click any of the payment buttons on this page to register. You can pay in full or in convenient monthly installments. Once you do, give us one business day to send you a formal welcome email. Your welcome email will have instructions to log into your member area, download your materials, get information about joining the live webinars, and contact us anytime for support. Because we are launching this program for the first time, we are offering it for the special introductory price of $2,500. You save $50 by paying up front or you can pay 10 convenient monthly installments of $250. This is about half the price of many more basic facilitation certification programs on the market and will not last long. This includes everything, even Certification as a Master Facilitator with the Center for Executive Coaching. Meanwhile, any single solution we offer – out of a package of 17 – has been offered to clients for anywhere from $12,000 to $60,000. That’s a pretty clear Return on Investment. Even if you start at a nominal day rate for one solution, a single engagement pays back your investment, and you still get ongoing value from the program with many future engagements. I sincerely hope that you see the value of this program and sign up now. The introductory pricing will not last long.